3.Pre-set the cutting start and end point to well control the cutting length. 4.The blades are sharp and indurable. And they can be sharpened between 7 and 10 times. 5. 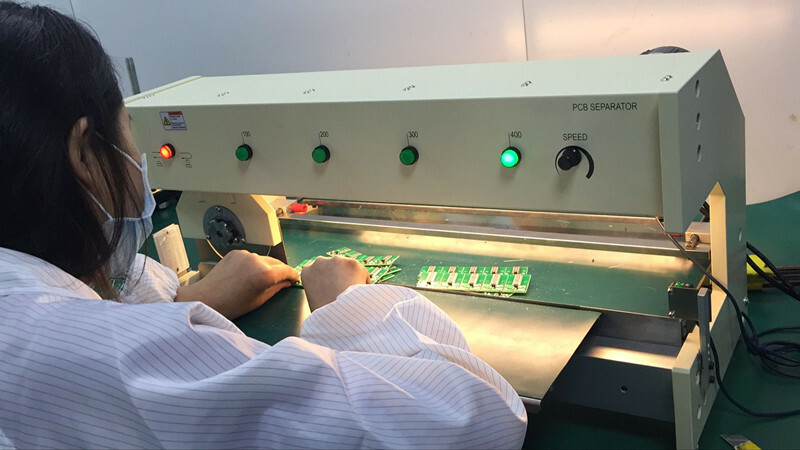 Minimize the shearing stress to avoid micro-cracks of the solder joints. 6. Coutrolled by microcomputer program, it can cut board accurately with no error. 7. Adjustable blade moving speed : 300mm/s or 500mm/s. As per customers' need, certain speed can be set. 8. Upper blade can be adjuable between 0 and 2mm to meet different thickness of PCB and V-cut. 9. Operation platform can be adjustable higher and lower between 0 and 50mm. Fix cutting beginning and ending point, upper circular blade moves and cuts against the lower linear blade to seprate the board into several units. There is no stress to board, so no damage to boards and electornic components.